The Philippines proposed joint naval patrols with the United States in the South China Sea amidst ongoing territorial disputes between Manila and Beijing, The Philippine Star reports. 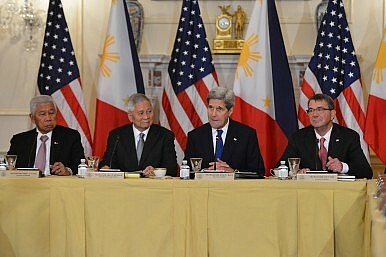 During the U.S.-Philippine 2+2 ministerial consultations (See: “US, Philippines Boost Ties In Ministerial Meeting”), held in Washington D.C. on January 12, the United States committed to maintaining a military presence in the contested sea, according to the Philippine’s Department of National Defense spokesman, Peter Paul Galvez. “The 2+2 meeting extensively discussed the South China Sea issue, with the U.S. side reiterating the U.S. ironclad commitment to the defense of the Philippines (…) The U.S. also conveyed that it remains committed to the AFP’s (Armed Forces of the Philippines) modernization program,” Galvez said. In addition, the Philippines pushed for clarification on the term ‘militarization’ in the context of China’s growing military presence in the disputed waters. “Noting China’s claim that it will not militarize the area, the US suggested the need for parties in the South China Sea to have a common and shared understanding of the term ‘militarization’ to avoid growing tensions. A common sense among the other parties would put pressure on China,” Galvez said. As my colleague Prashanth Parameswaran reported on Tuesday, this week the Philippine Supreme Court finally approved the Enhanced Defense Cooperation Agreement (EDCA) between the United States and the Philippines which both sides initially signed in April 2014, paving the way for closer defense ties between the two countries. In August 2015, Philippine Defense Secretary Voltaire Gazmin requested military assistance from the head of U.S. Pacific Command, Admiral Harry Harris Jr., to strengthen the Philippines’ position in the South China Sea, although the United States has made no detailed commitment to date. As I reported previously, the Philippines specifically asked the United States for assistance in monitoring the situation in the South China Sea in “real-time” by providing surveillance and reconnaissance assets, as well as air cover to a civilian ship that supplies military personnel stationed on and around the Second Thomas Shoal. The Philippines’ defense budget will rise by 16.3 percent to P115.8 billion ($ 2.5 billion) with total defense spending – including unprogrammed acquisitions and pensions – set to increase to P174.6 billion ($ 3.8 billion) in 2016. The Armed Forces of the Philippines modernization program within the core defense budget is slated to increase from P15 to P25 billion ($552 million) in 2016. The 2016 funds will be used to purchase two frigates, two twin-engine long range patrol aircraft, three aerial surveillance radars, and the first two out of a total of 12 FA50 light fighter jets ordered from South Korea.